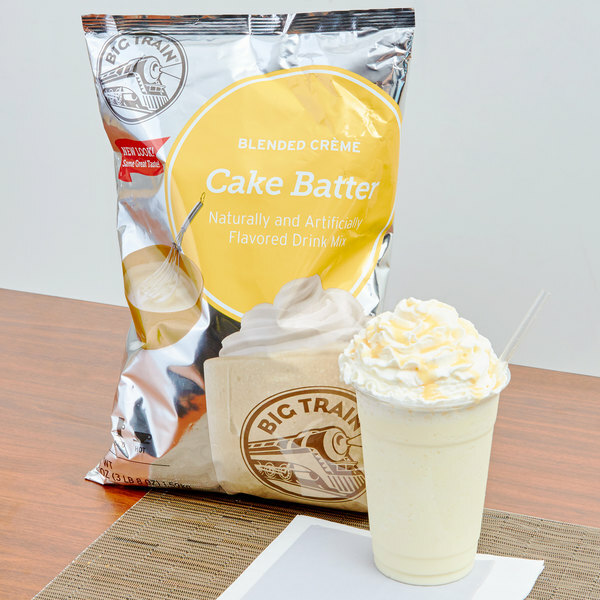 For a rich, indulgent drink your customers won't be able to resist, try this Big Train cake batter blended creme frappe mix! With a name symbolizing strength and constant motion, Big Train has expanded into a global foodservice brand you can trust with a large number of diverse products to choose from. 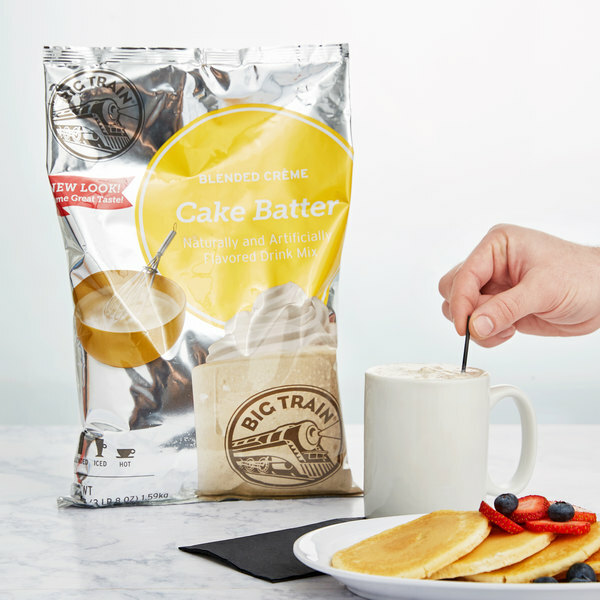 Big Train has become a leader in the specialty beverage mix industry, delivering easy-to-make and consistently-delicious products. The sugary sweet taste of fresh-mixed cake batter in the form of a blended drink will excite both kids and adults! It makes for a creamy gourmet drink, or it can be used as a base for cake inspired beverages enhanced with candy and cookie pieces. Treat your guests to a cake batter-flavored milkshake without needing to supply the ice cream, or create a one of a kind cake batter espresso or hot chocolate. Coffee and caffeine free, this blended frappe mix is the perfect alternative for customers who do not prefer coffee. Use this mix as a base for frozen dessert drinks, and delight all of your guests! They can rest assured that this mix is gluten free, trans fat free, and contains no hydrogenated oil. This mix is perfect for sprucing up the menu in your coffee shop or cafe in order to offer profitable, creamy, decadent drinks. Better yet, these drinks are easier than ever to make! Just add water for gourmet cake batter taste. This blended creme frappe mix adds alluring flavor to your signature iced, hot, or blended drinks, while satisfying your patrons' cravings for something sweet and new! I am sure like most of you love licking the spoon after mixing cake batter. The taste is very close to real cake batter. If you are a spoon licker you will love this. If one truly wants a drink or concoction that closely mimics birthday cake then look no further than Big Trains newly introduced Cake Batter Frappe Mix. All big trains are amazingly tasteful and caffeine free (I am highly sensitive). Its a great alternative to other products that house many artificial ingredients in their mixes. I will definitely be purchasing more of this flavor! Product was very tasty! Blended well. Added some birthday sprinkles and it was so cute. Will definitely be ordering it again. Customers really liked this flavor drink mix. This is my son's favorite flavor. as a kid I could never keep hi fingers out of the mixing bowl so he is in love. The Big Train Cake Batter Frappe is kind of running and very sweet however we have a lot of customers that really like it, and order it all the time. A sweet and creamy cake batter blended frappe mix that is great for making cake batter milkshakes. The mix smells great and tastes so authentic. This is a best seller among the kids. I'm not a fan of sweet drinks but I tried this and was really impressed. We serve it as birthday cake flavor with sprinkles! Customers loved this flavor and it went quick. It's flavor is exactly what you would expect, very vanilla tasting. Some customers didn't quite get the "cake batter" flavor out of it, but they still enjoyed it. We will probably order again soon. The cake batter frappe is one of the most popular frappes right by itself, but customers love to mix it up with other frappes bc it compliments them so well. Cake Batter is a favorite for our customers. 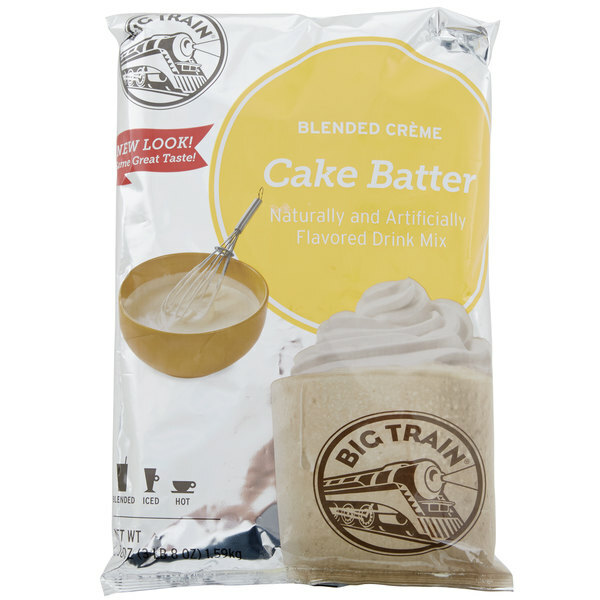 Big Train Cake Batter Blend Creme Frappe Mix is perfect for making our yogurt, we can never run out of this. We love Big Train products! The flavor in this cake batter mix is great. We'll definitely be adding this as a permanent addition to our lineup.